The embusen rule is basically that a kata should "balance". Each step in one direction should be countered by a step in the opposite direction. If they did the design of the kata right, you should always end up exactly back at the point you started. The kiten. It's good for performance of kata because you can run through a load of them without really moving, and in a small space, with a group of people. The limit to steps in any direction in okinawan kata is usually 3, giving approximately a 3mx3m (3yard x 3yard) training space. However. Imagine you're designing your kata, and the embusen doesn't quite fit the embusen rule meaning you end up not on the kiten. What do you do? 2. Fill with some "basics". This happens in one of my two forms. I'm 90 degrees out. So I bring my back foot up in line with my front foot and then step back through 90 degrees counterclockwise with the other foot. I'm not going to ignore it because of the practicality for both home and class practice of starting and ending on the same spot facing the same direction. I'm not going to fill with 'fluff' because everything that is there is there for a reason, everything omiited is either hinted at via coathangers, in another kata, or absent for a reason. See I think if you have a small dojo with relatively few people in it then the embusen rule is good but not essential. You can always just walk a few paces to the start point again. If you have 200 people though, it's absolutely essential. So when Itosu started to encourage karate for school children, the pinans would have to have been spot-on, with respect to the embusen rule and the kiten. The embusen rule is basically that a kata should "balance". It’s a modern “rule” that is most prevalent in the literature of Shotokan. 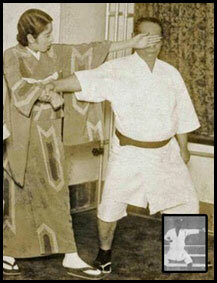 Funakoshi being the first to express the idea in Karate-Do Kyohan; but he makes no reference to it in earlier works. Because Shotokan is such a widely practised style, and Funakoshi’s writing is so widespread and influential, it has found its way into the thinking of other styles. However, most don’t follow this “rule”. We need to see it for what it is, and we should not view it as a long standing traditional dictate. If they did the design of the kata right, you should always end up exactly back at the point you started. The kiten. Ending up in the same spot was never a consideration when the kata were created. Why would it be? It is something that has risen up relatively recently and it’s a mistake to see it as being somehow fundamental to the way the kata have been constructed. We have seen some kata modified to fit this modern dictate, but it was not a rule that was fundamental to all kata as they were created. The kata were made by differing people, in differing parts of the world, at differing times. There was no meeting where the “rules” of kata were agreed upon i.e. “We, the undersigned, do solemnly swear that all of our separate kata must start and finish on the same place!” There is absolutely no need for kata to start and finish at the same place; it is a relatively modern phenomenon that has been superimposed on to the kata of some groups. You’d do nothing, and what’s more it would never even be a question you’d think to ask. You were creating kata to record combative methods and to provide a supplementary form of solo practise. Starting and finishing on the same place has zero bearing on either of those two objective so it would never even be considered. In my case, many of the kata I do don’t start and finish on the same place. They were never designed to! Some do (Naihanchi for example), but that’s not by design. When I was kata judging it was made clear to us, that even in modern competition, it was not something to be considered when scoring because many traditional kata don’t start and finish on the same place. In Shotokan, where the idea is more prevalent, it may be an indication that some of the other stances and angles were off, but the fact they failed to finish on the same spot, was not, in and of itself, something people were to be marked down for. I think the question is therefore flawed as you’ve assumed a universal dictate that was present in the thinking of those that created the kata. The idea of starting and finishing on the same place is not universal, only appeared long after the kata were created, and is not held to by the majority of styles. There’s no evidence for that. While Funakoshi expressed the idea in Karate-Do Kyohan – but not before that – other style, which also have Itosu in their lineage, don’t demand kata start and finish on the same place. As I say, it’s primarily just the Shotokan branch that developed this idea and expressed it in their literature. According to Mabuni, the angles in the kata (which combine to form the embusen), are indicating that we move to that angle, in relation to our enemy in order to, “to put ourselves in the most advantageous position to defend ourselves.” In short, the angle in the kata shows us the angle we attack the enemy from, it is not the angle they attack us from. 1 – Tactical positioning is a vital part of any technique. 2 – In the absence of a partner there is only one way to show an angle i.e. measure it relevant to your previous position. However, the idea that you need to start and finish on the same place serves no practical purpose and therefore will never have been a consideration when the kata were created. We practical karate types can there ignore it on the full understanding it is a modern arbitrary dictate that has no historical or practical foundation. I'm on the same page as you generally, but actually I do think that starting and ending on the spot has many practical considerations and furthermore have designed my two forms with that in mind. I don't doubt that it has also been a consideration in mind for earlier generations of karateka. My decision was not about aesthetics. It was about the practicalities of solo training for both me and those I intended to utlise the form. It was also about the practicalities of teaching and drilling the form in class. Where a form starts and stops has no practical combative function. Whether a form teaches you principles of movement does. If a form is not easy or convenient to practise then it can be 'combative gold' but it is not going to be practiced so often. One of the things that makes Naihanchi/Tekki useful is that it requires very little space to run through (indoors or outdoors) from start to finish. This makes it easy to do without shifting forwards or backwards to create space and also automatically resets for future practice. Of the traditional kata I prefer the Pinan/Heian kata or Bassai/Kushanku/Nijushiho to Naihanchi, not least because they work a greater range of stepping and turning movements in the superficial version of the form, but I have done Naihanchi more because it used less space, and space and embusen are practical training considerations at home. I like to break up the forms and drill individual parts, and hop from one part to another depending on what I am visualising, but to 'ingrain' the basic form it is best to be able to do it from start to finish. My two forms are a mass of different turning and movement drills along with tactics, but they are designed (not too unlike Naihanchi) to be done in an area 2mx1m and they start and end on the same spot as a deliberate practical teaching and training consideration. This enables me to train both solo and in groups in a imited space with ease of repetition and that is a very practical thing to do. I think Mabuni's view is an interesting one, but I don't limit myself to it. If my application of movements were limited to the embusen of the kata in the manner he suggests then I think my karate would be a lot poorer. I don't find his lack of attention to start/stop positions significant. I can't recall if he mentions bowing or coming to attention at the start and end of a kata, and yet that is a standard part of practice. How rigidly you start/stop in the same place is up to the individual practitioner, but for me starting and stopping in the same place has always been a practical consideration, and the fact that so many forms do so unforced within approximately a one stance tolerance indicates that this is not a modern aesthetical consideration but a longstanding training practicality consideration. I'm on the same page as you generally, but actually I do think that starting and ending on the spot has many practical considerations and furthermore have designed my two forms with that in mind. I don't doubt that it has also been a consideration in mind for earlier generations of karateka … My two forms are a mass of different turning and movement drills along with tactics, but they are designed (not too unlike Naihanchi) to be done in an area 2mx1m and they start and end on the same spot as a deliberate practical teaching and training consideration. This enables me to train both solo and in groups in a limited space with ease of repetition and that is a very practical thing to do. I can see what you are saying here with regards to your specific forms. We also have forms that were designed specifically to take dojo space into account (Shito-Ryu’s Shiho-Kusokun is often pointed to as an example of this). However, the idea that a kata has to begin and end on the same spot has no bearing on the ground covered by a kata, and hence has no bearing on the efficient use of practise space. It’s been suggested that ending on the same space is a “rule” (which I disagree with). The fact that kata needs to fit within the space in which it is practised is something else entirety. They are two different considerations. Ending on the same space simply means that at the end of the kata the total distance moved right (R) is that same as the distance moved left (L), and the distance moved forward (F) is the same as the distance moved backward (B) … it’s adds nothing to the “compactness” of the form because so long as L=R and F=B you’ll hit the sweet spot; regardless of how large or small those values are. As an example, let’s say that a past master has a 10 foot by 10 foot practise space. In total, the first kata he practises goes forward 8 feet (F=8), backward 5 feet (B=5), left 7 feet (L=7) and right 6 feet (R=6). So long as he starts at a suitable place, he can fit the kata into his practise space, but he will always end 3 feet further forward and 1 foot to the left … which means he will be 3.16 feet away from the Kiten (and I think that is the first time since I left school 27 years ago that I’ve used Pythagorean theorem for anything!). The second kata our master does has is perfectly symmetrical and, in theory, will always ends up on the Kiten. In total it goes forward 11 feet (F=11), backward 11 feet (B=11), left 7 feet (L=7) and right 7 feet (R=6). But we can’t fit this kata into the available practise 10 X 10 practise space. The point is, whether we start and finish on the same place has no bearing on the floor area covered. While I could fit Tekki Shodan into a small training space, I would not do the same with Kanku-Dai. And yet both, within most Shotokan groups, are meant to start and end on the same place. It’s the area covered that is significant and not the start /end spot. I think Mabuni's view is an interesting one, but I don't limit myself to it. If my application of movements were limited to the embusen of the kata in the manner he suggests then I think my karate would be a lot poorer. I find this to be one of the most useful “rules” for me. It makes clear what the relative positions are and it makes getting off the enemy’s line of attack, while keeping the enemy on your line of attack, a core part of the kata methodology. So I’ve found my karate to be much richer (and logical) for viewing kata in this way. So, for me and mine, it’s definitely something we’ve found to be of great value both in terms of analysing kata, and its combative function. I get where you are coming from though and we are both of the view that “cookie-cutter karate” is damaging to the art and the individual. So I’d never say this is a must-have viewpoint. "Twisting to the left or right from the Naihanchi stance will give you the stance used in a real confrontation. Twisting ones way of thinking about Naihanchi left and right, the various meanings in each movement of the kata will also become clear." It’s not that the enemy is attacking from the left and right, but rather that we are twisting left and right so that we end up to the enemy’s side. In short, Naihanchi’s embusen is telling us to assume a sideways position relative to the enemy. In the picture to the right we can see Motobu getting back slapped by a female student. The picture inset is Motobu performing the same move in Naihanchi. We can see how the student has positioned herself such that she is sideways on to Motobu, and in the process she has achieved a good position tactically (away from the live side, off the attack line, etc). So it would seem that both Motobu and Mabuni view the embusen as being the line we attack the enemy from, as opposed to the line the enemy attacks us from ... or other any other explanation. As before, I understand that others have other views, and the above is solely to explain why I hold the view I do. Could you explain why John? I’m with you with regards to your own personal forms and the available practise space, but do you feel it is a practical consideration for all kata? Kanku-Dai takes up no more or less space for starting and finishing on the same place. So is there some other benefit? Do you mind elaborating on that so I better understand your take on things? …and the fact that so many forms do so unforced within approximately a one stance tolerance indicates that this is not a modern aesthetical consideration but a longstanding training practicality consideration. I don’t think the past masters started with the idea, “Our kata must start and finish on the same place, so let’s construct them with that in mind.” I agree that many are often within a stance (the fictitious asymmetrical kata I used as an example above would be too), but that means we are not finishing on the same place, but roughly within 3 or 4 feet of where we started. That would not be expected if it was deemed that the kata must start and finish on the same spot. We are some distance off and perhaps approximating so that the rule can remain unbroken? The fact that most kata do not actually start and finish on the same place suggests it’s a by-product and nothing that was ever considered to be important or intrinsic to the nature of the kata. A more likely explanation, to my way of thinking, is simply that we can shift left or right because the enemy has two arms. If the kata shows shifting to the left and shifting to the right, then you may well end up near to the start … but crucially it was the desire to show both options that leads to a return to the centre, as opposed to a desire to arbitrarily return to the centre. Imagine you're designing your kata, and the embusen doesn't quite fit the embusen rule meaning you end up not on the kiten. What do you do? Most kata don’t “quite fit the embusen rule” and I’d say that is because there was no such rule. Some are quite a way off, most are within a few feet, some actually do start and end on the same place (and I would suggest that is by default and not through specific intent), and some have been tweaked to force that to happen in relatively recent times. Embusen I see as being an inherent part of the kata’s structure in order to record and rehearse the angle one should assume in relation to the enemy for that specific sequence. Kiten is something I totally reject. Absolutely, which is why I think the Tekki are so useful. Let me clarify here 'by same spot' I'm not thinking of 'exactly' the same spot to within cm, which I see more as an aesthetic thing. I'm thinking of ending up in roughly the same place facing the same way. If we don’t take the view that the angles are representing the angle taken, we do need to ask why there are these angles though? Different kata do have different footprints. That could be down to encoding different turning or sequence principles. It could be due to copying others (A has 3 steps therefore I will have 3 steps, B uses this angle therefore I will too), it could serve a combative function, or it could originally be due to the position of beams, trees or pot plants. While I can find a combative reason for different footprints, I can find a combative function for most things: that doesn't mean that it was the original intention. :) It would be nice to think it was but I wouldn't asume that was the case as a default position, just as I wouldn't asume (given the likely limitations on the genuine combative experience and knowledge of people in the 19th and earlier centuries) that every movement in a form has a decent practical combative application, but that's getting a tad off topic. For me it is about the practical ease of repetition, whether in solo training or in group practise of the solo form. Regardless of the floor plan covered, starting and ending in the same place is a practical consideration for repetition. I don't feel that starting and stopping in drastically different places is as efficient a form of training. I don't see this as a 'rule' but I would expect most people to see it as a desirable trait and to have that in mind. Are there any forms that seem to make no attempt to return close to the starting position? If being 7 foot away and facing in a different direction was the norm I would say it wasn't a consideration in the past, but as we're normally within a few feet (if not closer) and facing the same way, to me that indicates that it was a definite consideration in their construction. I think this is where we disagree. :) But we are disagreeing on what is 'the same spot' and thus drawing different conclusions. I don't necessarily see or treat the left and right as working the same technique on both sides, or addressing left or right arm attacks (which I can do in paired bilateral practice) though I can use them as an indicator that the movement done on the other side of a person with the same arms can have a practical application. For me the weighting is more about getting back to the centre than indicating the 'obvious' of doing paired work on both sides. With the same argument in mind you have to start finding 'reasons' for 3 steps forwards, 3 steps back etc, and I think the desire to train or string drills in such a way that you return to the start is more logical than any 2x one side and 1x the other, or 3 steps=3applications rationale. I could choose a different way to turn in classic I shaped kata (font letting me down here) that would result in a very different shape, the fact I turn how and when I do seems more logically structured to create a return. Just look at Shotokan's "Chinte" kata to see what happens when you try to change a kata to fit into the "embusen rule". It ends with 3 backwards hops. Many have tried to come up with applications, but in reality it is just to get you back to your starting point. There are some katas that through redesign accomplish starting and ending on the same spot. The main reason is for uniformity in stances and footwork. One of Tatsuo Shimabuku's first students, Advincula Sensei has said that all of Isshin-Ryu's katas (except Naihanchi) are designed to start and end on the same spot. So for them, in PERFORMANCE practice it is something looked at. But, not all styles have designed their katas this way, and as others have pointed out. When it hits the fan does it really matter? The reason I brought it up was reading "Seikichi Toguchi"s "Okinawan Goju-Ryu II: Advanced Techniques of Shorei-Kan Karate"
He describes the evolution of kata in chapter 5, covering the embusen rule and kiten. Of course this was printed in 2001, so very recent, and he doesn't quote any sources, though the implication is it came from Miyagi and applies to the older Goju katas from White Crane. "Embusen I see as being an inherent part of the kata’s structure in order to record and rehearse the angle one should assume in relation to the enemy for that specific sequence." This is understood, but you can tweak angles even with this constraint. Take the opening to pinan nidan. When pulling the opponent over backwards, the left hand example is done at 180 degrees and the right hand is done at 90 degrees. Does it really matter if it's 90 degrees or 180, the method's the same and it fits the desired H shape. but that means we are not finishing on the same place, but roughly within 3 or 4 feet of where we started. That would not be expected if it was deemed that the kata must start and finish on the same spot. We are some distance off and perhaps approximating so that the rule can remain unbroken? 3-4 feet is pretty good for hitting a spot after 20-50 steps in multiple directions turning backwards and forwards. You wouldn't run into trouble with 3-4 feet if you started people in a class a couple of yards apart. :) Maths is in everything. For me it is about the practical ease of repetition, whether in solo training or in group practise of the solo form. Regardless of the floor plan covered, starting and ending in the same place is a practical consideration for repetition. I don't feel that starting and stopping in drastically different places is as efficient a form of training. I don't see this as a 'rule' but I would expect most people to see it as a desirable trait and to have that in mind. Thank you for the clarification John. I can see that there may be some subconscious desire to make kata symmetrical, because we human beings like symmetry … but we also like function and I can’t see aesthetic considerations being given primacy over function i.e. you would not interfere with the function of the kata simply to get you back to the same place. Are there any forms that seem to make no attempt to return close to the starting position? I would say there are many. Chinte has already been mentioned by Kevin (hops added to ensure it does). My version of Jitte only has one forward palm heel (not three as in Shotokan) so it does not finish on the same place (all versions also end up facing in the opposite direction to where they started). Neishieshi ends up further back than where it started. Chinto shifts backward (and again ends up facing in a different direction to where it started). As I say, when I was kata judging we were specially told to ignore start and finish places due to the fact so many kata did not start and finish on the same spot. It’s also not listed as one of the criteria for decision, and the reason for this is that it’s not something all kata and all styles do. as we're normally within a few feet (if not closer) and facing the same way, to me that indicates that it was a definite consideration in their construction. Away from the human love of symmetry, I’m not with you here. They could, as was suggested in the original post, simply add in another (practically irrelevant) technique and you’d not be within a few feet, but bang on the Kiten. This has not happened, so I find myself of the view that starting and finishing on the same place was unimportant and that the integrity of the methodology within the kata was what was considered. So my answer remains, I’d do nothing – just as the creators of our kata did nothing – because returning to a specific point is not something most kata do. Many may end up within a few feet, but that is redefining the idea of the kiten as “general area” which in turn removes the raison d'être for the whole idea. It’s clear he is endorsing a specific place: a datum point by which to help judge the consistency of motion within the kata. If it were a general area, then the kiten could not be used in the way Funakoshi says it should. The whole section is taking about precession; so it makes little sense to measure that precession with an imprecise location. This idea that all kata must start and finish on the same place seems to originate in Kyohan with Funakoshi. It is also something that is not widely adhered to outside of Shotokan. Many non-Shotokan kata do not start and finish on the same place, and we have examples of Shotoakn kata being amended to fit this dictate (i.e. the Chinte hops). The evidence would therefore suggest the concept was not universal nor has it been around since the inception of all the various kata; otherwise it would be present in all styles and all kata. I am OK with the general l idea that humans like symmetry – as we see in buildings, art, the faces of people deemed attractive, etc – so therefore kata are constructed in line with that general human proclivity. However, I see no evidence for it being a universally agreed on rule when kata were created. There is no Kiten rapidly apparent in many kata (i.e. they don’t start and finish on the same point), but there are cases of kata being altered to coincide with that rule. I therefore remain of the view that it’s more a case of modern revisionism than a case of original overriding intent. You also have the question of why, generally speaking, the techniques on the “horizontal” and “diagonal” are in pairs, and techniques on the “vertical” tend to be in ones and threes? If the embusen was solely constructed to create a return (which would involve ignoring Mabuni’s and Motobu’s take on things), then why not move left and right in threes more often too? Also, why threes going forward and back? Why not 2,3,4,5, etc if the only purpose is a return to centre? Purpose of Angles in Kata: To indicate the angle you apply the technique from (as per Mabuni). Why things on the horizontal / diagonal are most often in pairs: The sideways / 45 degree angle means you assume a sideways / diagonal position onto your enemy (as per Motobu quote and pic on above post). Human beings are symmetrical so you can shift either left or right. On such a method you are away from the live side (uncontrolled side) of the enemy … so you are only considering the closest side, which becomes relevant when we move onto the next point. Why are things in threes or ones on the vertical line: Being on the vertical line means you are in front of the enemy. The kata therefore maps out probabilities based on the fact that most people are right-handed. When things are in threes, it is the one performed twice that is most likely / most efficient for a right-handed person (kata assuming you are right handed). If a technique is performed once, then it is that side that is most likely / most efficient for a right-handed person. This probability only applies when in front of the enemy; if you were to their side (as you would be on horizontal / diagonal motions) then this probability is an irrelevance as you will be working the side closest to you. Purpose of the Kiten: There isn’t one away from the later day aesthetics of the kata. There is nothing, that I’m aware of, passed down to us that explains why things are in threes. However, I have found the above to be true in the kata I have analysed and it proves to be a useful guide when analysing fresh kata. So, for my take on bunkai, the angles are not simply to get us back to the start, but a core component of the information within kata. That viewpoint has some historical backing, and it also informs why things are most frequently in pairs on the horizontal and diagonal, and in threes or ones on the vertical. When I put this hypothesis against the kata, I find it works consistently well. For me personally, I take the position that everything in the kata is combative; and that every single part of the kata has combative function (hand position, stance, angle, etc). As I say, I can accept that our natural proclivity to favour symmetry will manifest in some way in the kata, but the fact there is lots of asymmetry in kata (particularly on the vertical line) and that the majority of kata don’t start and finish on the same place (to me, 3 feet away is not the same place) leads me to the conclusion that the idea of Kiten originated late in the development of kata (i.e. was not a original consideration) and hence had zero in the way of influence on the way the kata was originally constructed. I think I agree with this statement here. But again, my knowledge of embusen in kata is limited to the kata I practice and I maybe wrong on the whole, but from what I can tell it seems most kata begin and end near the same place. I do think it is a practical consideration as you have to take into account the amount of room needed to practice. This is not to say that it is a rule or even important from a combative nature. But as a practical approach to training I think it would have been a consideration to the kata creators. I find Iain's point about the fact that the katas were created over a large span of distance and time. Therefore, there would be no "rule book" on how to create a kata. That being said, I wonder if there can be any rules of kata that can apply to all of them? In relation to the 4 things in the above quote, I wonder if their could be different answers to these in in different kata? For example could it be that in certain kata the reason we have sideways angles are for moving to the positon of the enemy (Mabuni) and maybe other times it is just to show a break from the previous technique and a the start of a new one? Or the reason there are three of one technique in one kata is that it shows it on the right twice (dominant side) and one on the left (weaker side) and in another kata, it is just to ensure when we perform a turning motion later (to resemble a throw), we have the room behind us to practice the movement? Im just thinking aloud at the moment, but I hope it contributes! Thanks for the clarification Iain. Good points Leigh. I do not currently have my two forms on youtube as the videos I have of them are rough 'end of a lesson' quick shots. If you feel that it would help then I could upload them? In relation to the 4 things in the above quote, I wonder if there could be different answers to these in in different kata? I think that’s a good observation, but would suggest that utility is bound to introduce some commonality. There was no meeting to agree on all the nuances of kata creation, so in that sense it would be expected to have some variation and we need to be mindful of that. However, practicalities are bound to result in different people adopting similar methods. As an analogy, no one person invented the bow and then went on a world time-traveling tour to ensure everyone fired pointy sticks in the same way. All cultures realised, independently, that fletches on arrow were a good idea to help them fly straight. All cultures independently realised that the tension in an arched piece of wood, maintained by strong cord, was a good way to fire arrows. And so on. Back to kata, we all know that getting off the enemy’s line of attack, while keeping them on yours, is a good idea. We therefore need to record this in our kata … and there is only one way to do that: illustrate the angle relevant to yourself (because in a solo form you are the only thing there is). The combination of these angles, will created the floor pattern (embusen) of the kata. There is no alternative way to record the angle between you and the enemy when the enemy is not there not illustrate it directly. This common need, combined with there being only one obvious way to do it, will result in this methodology occurring throughout kata despite the fact they were created independently. I therefore think it is reasonable to assume that common need resulted in common solution. Angles are needed in combat … we need to record that … these common needs result a common solution being adopted independently by all those creating kata. Conversely there is no need for kata to arbitrarily begin and end on the same place. Without the common need, and there being no meeting to enforce an arbitrary dictate, there is no reason to assume it would somehow manifest universally. I would suggest it has not manifested universally (tis idea is not present in all kata or styles) and hence there was no “rule of kiten” until Funakoshi establishes one. I fully take the point that there could be differences in the creation methodology of individual kata though; even when we factor in common need. Perhaps “guidelines” or “universal considerations” would be a better phrases than “rules” or “laws” when we are discussing the thinking that gave rise to the way kata are created? I’m with you here John and I think they are fair points. The line, “I think I would prefer to assume that the older generation had the skill to combine combative function and lessons with symmetry and effective use of available floor space without compromise” is a good summation of where you are coming from and I find myself broadly in agreement. I totally agree that the embusen is there in order to communicate, record and rehearse combative applications, hint at an order of lessons, fit a floor plan, etc so I totally agree it is far from random. I would also add – for my personal way of thinking – that the embusen primarily records the angle we assume in relation to the enemy. So again the embusen has definite purpose. What I find myself unable to accept is that the embusen was created to return to the kiten and that doing so was of prime importance (which was the question posed in the initial post). While all the former reasons are pragmatic in purpose and nature, the consideration of the kiten is purely arbitrary and, in my view, meaningless. However, as mentioned in the previous post, I do accept that we humans like symmetry so it’s reasonable to assume that that this aesthetic could have had a secondary influence, but it would never have been allowed to contaminate or compromise the primary considerations of combative function. I think that’s a good question and it’s sparked a great thread. For me the short answer is “none of the above” as returning the exact same place would not have been a consideration. And even if it were, you would not add moves in order to return to the same place as doing so would run contrary to the primary nature and purpose of kata. I think I speak for us all when I say we’d love to see them! Not only for the purpose of this thread, but simply to see a modern kata and observe the methodology applied. Really happy with this thread. I think that this has been a very thorough discussion of the ideas of embusen and kiten and there is loads of readers to ponder over. Thanks all!